Quilting Adventures: A break from the DSM ... ! Is it hot enough for you people in the northern hemisphere? OMG, I think this summer is going to be in the category of one of the hottest in a long time. 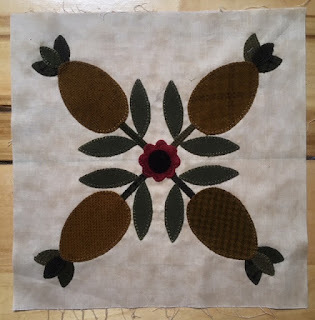 Took a little break from machine piecing and picked up the UFO - BOM Beauty all Around and worked on stitching a couple of blocks. Those blocks are beautiful. I hope it cools down for you soon. Oooh, aren't those pretty blocks! I love prepping a bunch of stuff ahead of time too -- sooo efficient! Ha ha! I have this pattern too :D after seeing your lovely blocks I might just have to make it!! I did a search to see what the quilt looks like that you did the wool applique for. Geoff's Mom. She has some good designs and you are doing the blocks in very good fashion.